You know that discussion with your supplier about pricing you’ve been meaning to have? In fact, it’s past time. Cost reductions won’t happen on their own. 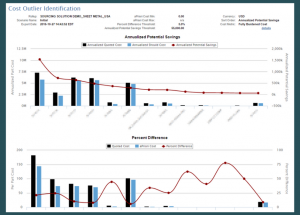 Conducting a spend analysis leveraging should cost data is a reliable way to come to the table with your supplier prepared and educated so that you can get the absolute best pricing on parts. And the best part? You will know you’ve done your homework, and so will your supplier. The following are five simple steps to prepare for productive cost reduction negotiations with your supplier(s). You’ll want to gather as much information you can about pricing on all components currently sourced at this supplier. It doesn’t make sense to discuss each individual part in your first meeting, so the next steps will help you determine ahead of time which parts have the best opportunity for price reduction. That’s where should cost can help. Start by focusing on a specific sector of your commodity that is your supplier’s core competency. An example may be aluminum sheet metal parts fabricated in North America. Collect a detailed should cost estimate for as many components in that commodity sector as you can, even if they are produced by multiple suppliers. Make sure to get a detailed should cost breakdown. For now you’ll need just the number, but later you’ll reinforce your positon with detailed facts like material utilization, scrap rates, and machine cycle time down to the second. Although you can identify potential cost-saving opportunities manually, a product cost management software tool can analyze a greater number of parts faster and use more sophisticated filters. An outlier analysis is a bar graph (see image below) that ranks components from highest to lowest based on the difference of what you’re currently spending (what you’ll pay if you do nothing) and what you should be spending (your should cost) on an annual basis. To translate how your actions could affect your commodity’s spend, it’s convenient to record these differences in terms of annual spend, meaning multiplying the difference of each component’s current cost and its should cost by its annual volume. An outlier is any component that has a significant difference between current price and its should-cost estimate. A difference is considered significance if it is 20% or greater. 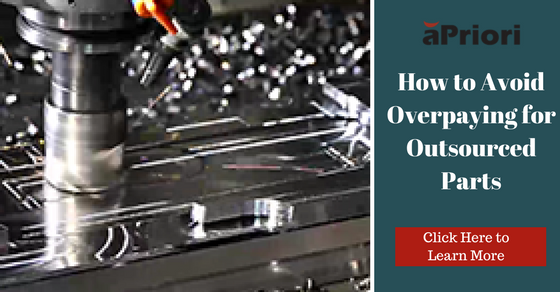 Look for patterns of outliers in components that have a common supplier, weight class, or manufacturing process. Respectively, these outlier patterns provide clues about a supplier’s business conditions, raw material or handling cost drivers, or production inefficiencies that lead to more specific discussions. You now have a list of outliers that represent the agenda for your meeting. For each outlier, you have a detailed breakdown of the outlier’s should cost. These are your opportunities for cost reduction. The components that are not outliers in your analysis can be assumed to be fairly priced, and you can agree to back off negotiating price on these outliers as concessions when driving to negotiate price reductions for the outliers. You’ll likely get the attention of the sales rep by asking questions reinforced by facts and data. A should cost breakdown like an aPriori Part Cost Report is a great cheat sheet to help you present your secret weapon – educated assumptions about your supplier’s manufacturing methods and costs. You are now armed with the data you need to avoid overpaying for your outsourced parts leveraging should cost data. For an even deeper dive into cost reduction strategies, feel free to peruse our page: Avoid Overpaying For Your Outsourced Parts.